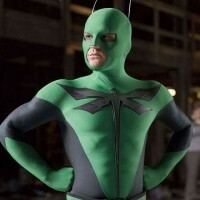 Dragonfly is a fictional character, superhero and protagonist of the 2008 comedy movie "Superhero Movie" written and directed by Craig Mazin, where he was portrayed by singer and actor Drake Bell. His super powers are the ability of climbing walls, an unusually high agility and a thick skin that can't be penetrated by regular weapons such as knifes, he however has a weakness when it comes to titanium, the only material that is able to leave physical harm on him. Much of the movie involves around Dragonfly being frustrated by not knowing how to fly, despite having insect powers. In his everyday life, Dragonfly is Rick Riker, an outcast desperately in love with his friend and neighbor Jill Johnson, who on the other hand is mated to school bully Lance Landers. He lives with his aunt and uncle, after his parents have been killed by a robber, partly due to Rick's own fault. He developed his super powers after being bitten my a chemically enhanced dragonfly. Dragonfly is a parody of classic superheroes, most notably Spider-Man/Peter Parker.